GEL SMOOTHER FOR CONNECTION POLYPROPYLENE AND PVC PIPES AND COUPLING WITH GOMMETS. FRICTION SMOOTHER FOR CONNECTING PIPES AND COUPLING WITH GROMMETS. 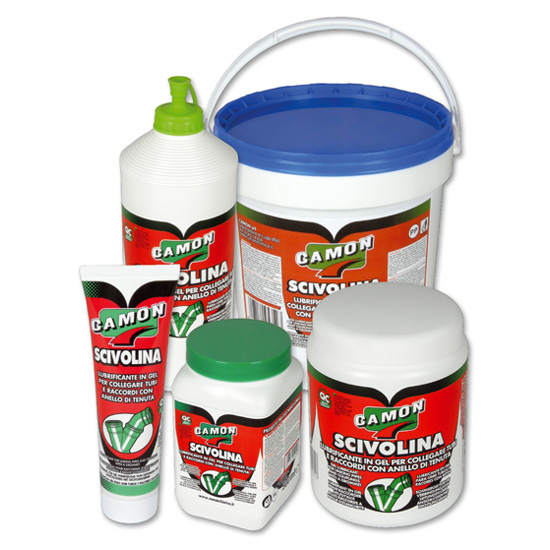 PRODUCTION DESCRIPTION: Scivolina is a non-toxic silicone lubricant. By drying up, it will form a thin lubricating coat on the treaded parts which will mantain its properties unaltered over time. This product does not contain any soap which, over time and with moisture, would release corrosive alkalis etching the rubber grommets. FIELD OF USE: Scivolina has been developed for greasing the pressurised joints of exhaust pipes type UNI 303 and UNI 313, as well as polypropylene of Asbestos cement exhaust equipped with rubber grommets. INSTRUCTIONS FOR USE: Scivolina is extremely easy to use; coat the grommet with just the required greasing amount, after which, the two pipe ends can already be joined. For better connection efficency, we recommend applying some product on the grommet-free pipe end too. WARNING: The product should be stored at temperatures comprised between +10°C and +25°C. SPECIAL WELDING GLUE. QUICK SEALING MASTIC FOR GLUING P.V.C. PRESSURED OR UNPRESSURISED PIPES AND COUPLINGS. 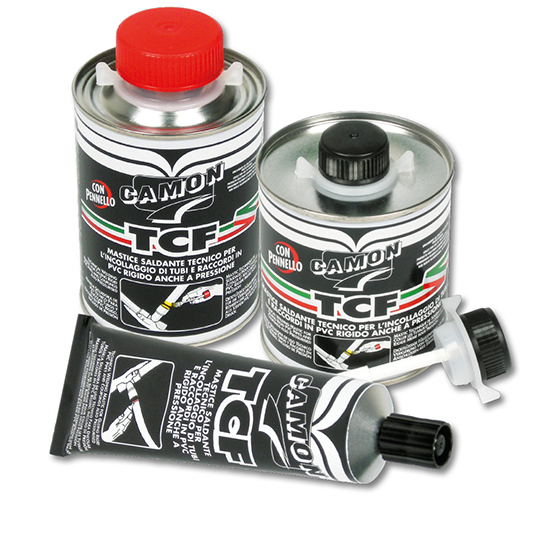 PRODUCT DESCRIPTION: TCF can be easily applied thanks to its controlled viscosity, which also prevents any trickling. TCF-PVC perfect compatibility produces a welding-like effect on the glued up pipe connection. TCF's resistance to corrosive-chemical agents is equal to PVC material itself. FIELD OF USE: Pipe and union assembling pressure piping, potable water pipes, gas pipes, gutters, rigid PVC pipes for electric cables. INSTRUCTIONS FOR USE: PIPE CUTTING: it has to be perpendicular, check pipe-socket allowance within 0.4 - 0.7 mm. PIPE BEVELING: only to be carried out on the pipe to be introduced, according to the pipe diameter. CLEANING: clean both surfaces with CAMONET detergent. GLUE APPLICATION: we suggest to check the gluing depth so to spread the glue on the whole surface, thus preventing any insufficient covering or waste of material. FILLER PASTE MASTIC FOR PVC PIPE AND COUPLING GLUING. RED PVC PIPE AND COUPLING SEALING MASTIC PASTE. 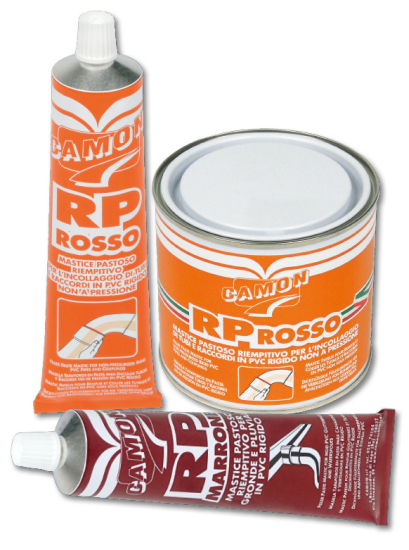 PRODUCTION DESCRIPTION: RP is a thick, pasty sealing mastic with very good gluing properties; it will not trickle and ensures the greatest strength after application. It is a quick setting product that will withstand stress after as early as approximately 36 hours. After 72 hours, this mastic will reach its greatest strength and remain equally strong over time. RP withstands temperatures ranging from -40°C to +180°C and will not be altered by any acid or basic agent at normal concentrations after application. This product will not alter the characteristics of the part to which it is applied. FIELD OF USE: RP is suitable for joining PVC hot water pipes and couplings, stiff PVC gutters and for the production of special parts such as branches, diverters etc. 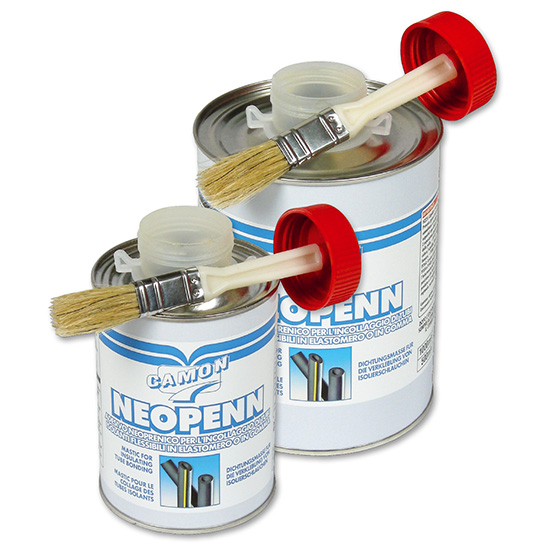 Coming as a paste it is particularly suitable for gluing pipes and couplings with some clearance between the matching surfaces. INSTRUCTIONS FOR USE: RP is easy to apply. However, a few recommendations should be observed. The surface to glue should be perfectly clean (CAMONET detergent is recommended) and dry. Use a brush to coat both parts to glue with product until a thin layer is obtained; join the two parts to glue with a light twisting movement if it is a tube or a light sliding movement if it is plates, in order to le out any residual air. WARNING: The product should be stored at temperatures comprised between +10°C and +30°C. MASTIC FOR INSULATING TUBE BONDING. PRODUCTION DESCRIPTION: NEOPENN is a neoprene-based cement which can be brushed on to bond elastomer or rubber hose section. INSTRUCTIONS FOR USE: Thoroughly clean the matching parts before bonding. After executing this operation, apply a coat of cement on the matching surfaces with a brush and let dry for 10-15 minutes, then overlap and press together the two parts to bond. 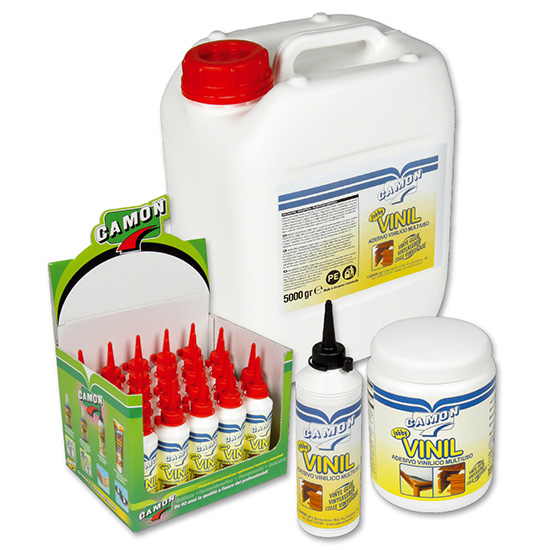 PRODUCTION DESCRIPTION: JOBBY VINIL is a polyvinyl acetate-based glue in an aqueous emulsion. FIELDS OF USE: JOBBY VINYL is particularly suitable for gluing wood, plywood, laminated plastic, veneers, cork, paper, cardboard, leather, fabric, tiles and porous materials in general. INSTRUCTIONS FOR USE: The surfaces to be coated with glue should be cleaned, degreased and dusted beforehand. Protect the product against frost. Store and use at temperatures not lower than 6°C. Contact us, click this link!